I’ve been in a bit of a creative and professional funk lately. It’s month 8 of my what’s-a-librarian-to-do-with-no-library-job-opportunities-in-a-20-mile-radius saga, and I’m tired of whining about it. With much encouragement from The Professor, I’ve decided to write a little every day, whether it be about issues professional or personal. It will give me the intellectual outlet that scanning and bagging books does not, and it will hopefully help me sort out and narrow down my varied interests in librarianship. I originally heard this idea from a speaker at one of NMRT‘s sessions at either ALA Annual or Midwinter 2009 (forgive me, but conferences are starting to run together). I know it’s not a new idea, but it was the first time I’d heard it, and it made a lot of sense. 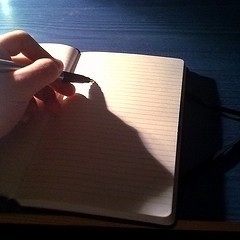 Making time to write is a habit, just like finding the time to exercise. I’m hoping that eventually I’ll look forward to writing every day the same way I look forward to a good run on a sunny spring day. This doesn’t mean I will be posting everyday (sometimes pieces take a few days to flesh out). This doesn’t mean what I write will be awesome (especially on days when I’m cranky and reluctant to write). This doesn’t mean I’ve given up a full-time job search. Quite the contrary! I’m hoping that this endeavor will help me keep in mind why I haven’t given up on being a librarian, even when local jobs aren’t on the budget.